The LaGuardia Community College Translatathon 2019 will be held April 4 & April 5 at LaGuardia Community College, in Queens, New York City. 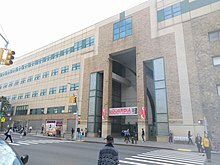 LaGuardia Community College is hosting the second annual Wikipedia Translatathon! At this event, anyone from the public is invited to LaGuardia to join students, professors, and CUNY faculty in translating Wikipedia articles among any languages which attendees understand. Themes for this event include public health and the history of New York City. All are invited, with no specialized knowledge of the subject or Wikipedia editing experience required. Please bring your laptop and power cord; we will provide research resources, WiFi, and a list of suggested topics. Check out the event page for the 2018 Translatathon for more ideas. Please register on dashboard after signing into your Wikipedia account. Who can attend: Everyone, but bring an ID card! What to bring: Please bring your laptop, power cord and ideas for entries that need updating or creation. For the editing-averse, we urge you to stop by to show your support. There will be computers available in the lab. Guest wifi accounts available if you bring a laptop. 12:00pm: #RadicalLegacyBuilding: Historically Undervalued Languages & Wikipedia as a Tool for Language Advocacy. Presentation by Wynnie Lamour (E-111). 5:00pm till: Closing Celebration with Chocolate Cake! Consider working on one of the artists listed on Black Lunch Table's list, the Women In Red list, or the WikiProject Women Artists for more contribution ideas. w:Coney Island Mermaid Parade is the largest art parade in the United States. Translated into French. w:Macy's Thanksgiving Day Parade is one of the world's largest parades. Translated into German, Spanish, French, Bahasa Indonesia, Korean, Portugese, Chinese, Japanese, Dutch, Simple English, Swedish. w:New York's Village Halloween Parade is the world's largest Halloween parade and the only nighttime parade in New York City. Translated into Spanish, Korean, Hungarian, Bahasa Indonesia. w:Puerto Rican Day Parade held in honor of the nearly four million inhabitants of Puerto Rico and all people of Puerto Rican birth or heritage residing in the mainland U.S. Translated into Spanish, Persian. w:Dominican Day Parade started in 1982 and celebrates Americans on Dominican origin. Not translated. St. Patrick's Day Parade is the largest Saint Patrick's Day parade in the world. w:Labor Day Carnival is the annual celebration of Caribbean culture, centered around the Labor Day Parade. Article needs some updating and editing. Translated into Arabic. w:Philippine Independence Day Parade is the largest celebration of Philippine Independence outside of the Philippines. Not translated. w:New York City LGBT Pride March is one of the biggest celebrations of gay, lesbian, bisexual, transgender and queer pride in the world, held annually in June along with month of events. Translated into Korean, Swedish and traditional Chinese. w:Antigua Carnival is a celebration of the emancipation of slavery in Antigua. w:Crop Over is a traditional harvest festival which began in Barbados, having had its early beginnings on the sugar cane plantations during slavery. w:Holi is a Hindu spring festival also known as the "festival of colours" or the "festival of love." w:Carnaval de Oruro is a religious festival dating back more than 200 years that takes place in Oruro, Bolivia. It is one of UNESCO's Masterpieces of the Oral and Intangible Heritage of Humanity. w:Quebec Winter Carnival is the second largest winter festival in the world after w:Harbin International Ice and Snow Sculpture Festival. w:Karva Chauth is a festival where married women, especially in Northern India, fast from sunrise to moonrise for the safety and longevity of their husbands. w:Harbin International Ice and Snow Sculpture Festival is the largest ice and snow festival in the world. w:Adloyada (Hebrew: עדלאידע or עדלידע, lit. "Until one no longer knows") is a humorous procession held in Israel on the Jewish holiday of Purim. w:Sitalsasthi is a Hindu festival that celebrates the marriage of the deities Shiva and Parvati. w:Up Helly Aa can refer to any of twelve fire festivals held annually in the Shetland Islands of Scotland to mark the end of the yule season. w:La Tomatina is a festival in which participants get involved in a tomato fight purely for entertainment purposes. w:Ramnavmi is a spring Hindu festival that celebrates the birthday of the god Rama. w:it:Infiorata di Genzano is a flower festival in Genzano, Italy. (Wikipedia only has an article in Italian). w:SantaCon is an annual pub crawl in which people dressed in Santa Claus costumes parade in several cities around the world. w:Vasant Panchami marks the beginning of preparations for Spring; observed by Hindus in India and Nepal, and is a tradition of Sikhs as well. w:Sylvia Rivera was a Latina American activist for gay liberation and transgender rights. Translated into Catalan, German, Spanish, French, Italian, Hebrew, Albanian, Simple English, Serbian, Swedish, and Turkish. w:Marsha P. Johnson was a Black gay liberation activist, drag performer and AIDS activist. Translated into Catalan, Danish, Greek, Spanish, French, Italian, Hebrew, Dutch, Albanian, Serbian, Serbo-Croatian, Swedish, and Turkish. w:Salsa Soul Sisters is one of the first, and now the oldest, organizations for lesbian women of color in the United States. Not translated. Raymond Castro was an immigrant from Puerto Rico who was in the Stonewall riots. He is prominently featured in the documentary Stonewall Uprising. There is no WP article on him in any language. w:Sylvia Rivera was a Latina American gay liberation and transgender rights activist significant in the LGBT history of New York City and of the United States as a whole. w:Ms. Colombia (aka Guillermo Vásquez) was a New York parader. There is a draft article that could be included in the Queens Pride Parade and/or Jackson Heights article. w:Julio Rivera was a gay bartender murdered by three young men in Jackson Heights. His killing sparks a wave of activism in Jackson Heights. No WP article in any language. w:Julio of Jackson Heights is a documentary about Julo Rivera (see above). No WP article in any language. w:13th (film) (2016; English). An American documentary that explores the "intersection of race, justice, and mass incarceration in the United States." Needs citations. Translated into Danish, French, Bahasa Indonesia, Italian, Portuguese, Swedish, Persian, Japanese. See this STUDY GUIDE to help editing. w:A Gentle Night (2017; Chinese). A distressed mother tries to find her missing daughter throughout the night. Translated to Persian. Ave Maria (2016; Arabic, English, Hebrew). A family of religious Israeli settlers has their car break down in a rural area of the West Bank and they must seek the help of five nuns to get back home. Translated to German, Spanish, Bahasa Indonesian, Portuguese. w:Do I Have to Take Care of Everything? (2012; Finnish). A comedy about a busy morning in a family and a mother who is trying to take care of everything by herself. Translated to German, French, Finnish, Swedish. Suggested edits for Do I Have to Take Care of Everything? The Door (2008; Russian). A man steals a door and we learn why he has done it. Listed under w:Academy Award for Best Live Action Short Film. w:Sleep Dealer (2008; Spanish, some English). Set in Mexico. A dystopian future in which technology both oppresses and connects migrants. Translated to German, French. Camps, Martín. “Sleep Dealer.” Chasqui (01458973), vol. 40, no. 2, Nov. 2011, pp. 243–244. Carroll, Amy Sara. “From Papapapá to Sleep Dealer : Alex Rivera’s Undocumentary Poetics.” Social Identities, vol. 19, no. 3/4, July 2013, pp. 485–500. Chang, Chris. “Sleep Dealer.” Film Comment, vol. 45, no. 5, Sept. 2009, p. 77. Clover, Joshua. “The Future in Labor.” Film Quarterly, vol. 63, no. 1, 2009, pp. 6–8. Cravey, A., Palis, J. & Valdivia, G. Imagining the future from the margins: cyborg labor in Alex Rivera’s Sleep Dealer. GeoJournal (2015) 80: 867. Donohue, Micah K. “Borderlands Gothic Science Fiction: Alienation as Intersection in Rivera’s Sleep Dealer and Lavín’s ‘Llegar a La Orilla.’” Science Fiction Studies, vol. 45, no. 1, Mar. 2018, pp. 48–68. Jeffries, Fiona. “Cyborg Resistance on the Digital Assembly Line: Global Connectivity as a Terrain of Struggle for the Commons in Alex Rivera’s Sleep Dealer.” Journal of Communication Inquiry, vol. 39, no. 1, Jan. 2015, pp. 21–37. Martín-Cabrera, Luis. “The Potentiality of the Commons: A Materialist Critique of Cognitive Capitalism from the Cyberbracer@s to the Ley Sinde.” Hispanic Review, vol. 80, no. 4, Sept. 2012, pp. 583–605. Medel, China. “The Ghost in the Machine: The Biopolitics of Memory in Alex Rivera’s Sleep Dealer.” Camera Obscura, vol. 33, no. 97, Jan. 2018, pp. 113–137. Suppia, Alfredo, and Igor Oliveira. “Cibertíteres: Discurso Marxista e a Colisão Entre o Público e Privado No Cinema de Alex Rivera.” Ciberlegenda, vol. 1, no. 26, Jan. 2012, pp. 191–201. Wells, Sarah Ann. “The Scar and the Node: Border Science Fiction and the Mise-En-Scène of Globalized Labor.” The Global South, vol. 8, no. 1, 2014, pp. 69–90. w:The Silent Child (2017; British Sign Language English). The story of a deaf four-year-old girl who lives a silent life until a social worker teaches her how to communicate through sign language. Translated to German, Persian, French, Italian, Latvian, Portuguese. w:Stonewall Uprising (2010 documentary film). Examines the events surrounding the Stonewall riots in New York City in 1969, which helped spark the movement for LGBT rights. b. Adding another critic's review to the Reception section. w:Metrodora was a Greek physician and author of the oldest medical text known to have been written by a woman, On the Diseases and Cures of Women (Περὶ τῶν Γυναικείων παθῶν τῆς μἠτρας). w:Rebecca Lee Crumpler was the first black woman to earn a medical degree in the United States. w:Mary Sewall Gardner was an American nurse who established the National Organization for Public Health Nursing and wrote the first public health textbook for nurses. w:Patricia Goldman-Rakic was the first scientist to chart the frontal lobe of the brain, and her research has contributed to diseases like Alzheimer’s and Parkinson’s. w:Wafaa El-Sadr is known for her efforts in helping research and develop programs relating to HIV/AIDS and infectious diseases. w:Ina May Gaskin is the "most famous midwife in the world." w:Regina Benjamin was appointed by President Barack Obama to be the 18th U.S. Surgeon General. w:Selma Dritz tracked the first known cases of Acquired Immune Deficiency Syndrome (AIDS) in the early 1980s. w:Charlotte Ellertson was instrumental in influencing the FDA to approve the RU-486 abortion-inducing pill. w:Helen Fisher (anthropologist) is a leading expert on the biology of love and attraction. w:Nancy Miriam Hawley was one of the founders of the Boston Women's Health Book Collective, Inc., the creators of the influential book on women's health and sexuality, w:Our Bodies, Ourselves. w:Mary-Claire King is known for three major accomplishments: demonstrating that humans and chimpanzees are 99% genetically identical; identifying breast cancer genes, and applying genomic sequencing to identify victims of human rights abuses. w:Susan Love is regarded as one of the most respected women’s health specialists in the United States, a prominent advocate of preventive breast cancer research. w:Marion Nestle is one of the most influential food thinkers of our time. w:Lulu Hunt Peters is considered the mother of the American diet book. w:Anna O., a patient whose treatment is regarded as marking the beginning of psychoanalysis. Find out the Marshalls--use contact information? Copquin, Claudia G. The Neighborhoods of Queens. New Haven, Conn: Yale University Press, 2009. Print. Hernandez, Raymond. “High Spirits Dominate Gay Parade in Queens.” The New York Times, June 7, 1993, B3. The Lavender Line: Coming Out in Queens. Eds. Stephen Petrus and Soraya Ciego-Lemur. LaGuardia and Wagner Archives, LaGuardia Community College/CUNY, 2018. Shpuntoff, Richard. Julio of Jackson Heights, documentary, 2016. The best way to get started at this event is to talk in person with one of the trainers at the event. As advanced preparation, anyone might select a Wikipedia article which interests them and which they might like to translate at the event. 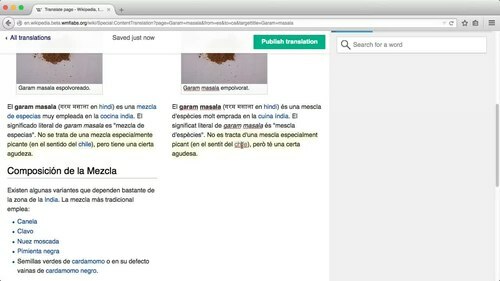 The best way to learn Wikipedia's method for translation is to come to the event, listen to the presentation, then ask for assistance at your computer if you need it. If you want to read technical documentation on your own then click "show" to the right and read the following guides. If there is still no result, that article has not been translated. Start a translation! After publishing a translation create a Wikidata item for the concept. List the original article there and your translation so that they will be interconnected. Ask for assistance with this if Wikidata looks confusing. If you find a Wikidata item for a concept, then the Wikidata item will list all language Wikipedia articles covering that concept. 2. Using the English Wikipedia, find an article that interests you. Then, look to the left of the page, in the gray bar beneath the Wikipedia globe. At the tail end of that list of links, you'll see "Languages," and links to all of the languages that also have that article. Languages are spelled in that language's alphabet or phonemes. For example, you won't see "Japanese" or "French," you'll see "日本語" and "Français". Is the language you're studying listed? If so, click the language to see the same article in that language. You can compare the two articles to get a sense of what one has that the other does not. If not, that means there's no corresponding article in that language. 3. Head to the Wikipedia in the language you are studying. In the search bar, type: WP:GA (this will also work with Wikipedias using non-Roman alphabets). You'll be taken to a list of "Good Articles" on that language's Wikipedia, the best articles it has to offer. (You may need to find the page that lists them, if it's separate). Find a Good Article on your target language's Wikipedia. Check the bar on the side to see if there is a corresponding article in English. If there isn't, great! You can translate the article into English, and contribute it to the English Wikipedia. Sometimes, the article exists, but is very short. That's OK, too. However, if both languages have well-developed pages on the topic, you will want to find another article. It can be very challenging to add content to an already-developed article. For best practices when it comes to working with Latin-Extended and non-Latin character sets, see our Keyboard Optimization Guide. Thanks to the organizations and projects which are supporting this event!